Super Lawyers Selects St. Charles, Illinois, Lawyer Tricia D. Goostree for 2018 Honor. 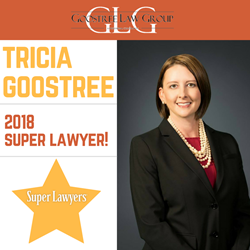 Goostree Law Group is proud to announce that managing partner Tricia D. Goostree has been chosen for Super Lawyers’ list of outstanding lawyers in Illinois for 2018. It is the third consecutive year that Goostree has received the honor. Super Lawyers is a nationally recognized rating service that annually selects the top attorneys in each state. Attorneys are nominated by their peers or identified from research or third-party feedback. Super Lawyers chooses its honorees based on independent research and evaluation by a peer panel. Attorneys who make the Super Lawyers list are among the top five percent of nominated attorneys in their state. Goostree was previously named to Super Lawyers’ Rising Stars list from 2011 to 2015. The honor is given to attorneys who are age 40 or younger or have been practicing law for 10 years or less. Kane County attorney Tricia Goostree is the owner of Goostree Law Group and concentrates her practice on family law and divorce. She represents clients in complex areas of law, such as issues of spousal support, contested allocation of parental responsibilities, litigation and appeals. Besides her Super Lawyers honors, Goostree has been a Leading Lawyer since 2015 and was certified as a member of the Lawyers of Distinction in 2017. The American Institute of Family Law Attorneys named her one of the 10 Best Attorneys for Client Satisfaction in Illinois for 2017. Goostree received a bachelor’s degree in political science and government from Eastern Illinois University in 1998. She earned her juris doctor from the John Marshall Law School in Chicago in 2002. Outside of her work, Goostree volunteers her time and knowledge to professional and service organizations. Through the Kane County Bar Association, she has served as chairperson of the Admissions and Membership committee and high school mock trial coordinator. She was a member of the board of directors of Prairie State Legal Services for four years. She also finds time to provide pro bono legal services to those in need and volunteer at the Northern Illinois Food Bank. About Goostree Law Group, P.C. Goostree Law Group, P.C., provides family law representation for clients in Kane County and throughout Northern Illinois. Founded more than a decade ago, the firm handles divorce and family law issues, such as property division, allocation of parental responsibilities, child support, spousal maintenance, legal separation, adoptions, relocation, prenuptial agreements, and post-divorce modifications. Goostree Law Group has offices in St. Charles and Wheaton, Illinois. To schedule a free initial consultation, contact us online or call 630-584-4800.